This salad uses my favorite salad-for-dinner technique of building a big salad platter with lots of ingredients so that people can choose the ingredients they enjoy the most. 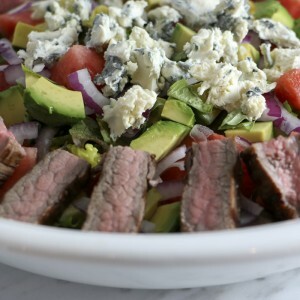 I borrow aspects from a few of my other recipes: Grilled chopped salad with chipotle vinaigrette, Killer chicken tacos and Roast turkey cobb salad, and combine them for a flavorful southwest salad that is substantial enough for dinner. If you like my salad-for-dinner recipes, you may want to consider purchasing a large oval serving platter. Southwestern flavors liven up this turkey and grilled vegetable salad-for-dinner meal. Serve it up on a big platter so everyone can select their favorite ingredients. Heat oven to 350 degrees. To make spice mix combine first 6 ingredients in a small bowl. Set aside. Rub the turkey thighs with olive oil and season with 1 T of the spice mix. Roast for 45 minutes. Cool and chop into 1/2" chunks. Set aside. Toss sweet potatoes in olive oil and sprinkle with 2 T spice mix. Roast potatoes for 30 minutes, turning after 15 minutes. For dressing, put vinegars, chipotle chili, adobo sauce and garlic in a small bowl. Whisk in 1/3 cup olive oil. Stir in blue cheese and season with salt and pepper to taste. Heat grill to medium high. Rub corn, pepper and zucchini with olive oil and sprinkle with remaining spice mixture. Grill vegetables until they have nice grill marks and vegetables are tender. When cool enough to handle, chop pepper and zucchini into 1/2" cubes and slice the corn from the cob. Spread the lettuce out on a large serving platter. Arrange each of the vegetables, the diced turkey and the beans in strips across the serving platter. Drizzle dressing over the top of the lettuce. Like the idea of make your own salad all on one plate as I have a lot of non vegetable eaters in my house. Looks Yummy!